"Buffer I/O error on device zram0, logical block 515067"
Commit 12a7ad3 "zram: avoid access beyond the zram device" introduced a regression where valid_io_request() checks if request end coincides with disksize (end equals bound). It fails if we attempt to read beyond the bound. [ 14.666280] zram: module is from the staging directory, the quality is unknown, you have been warned. Commit 75c7caf5a052ffd8db3312fa7864ee2d142890c4 "zram: allow request end to coincide with disksize" fixes the issue by correcting the test in valid_io_request() function. I was able to reproduce the issue by simply installing zram-config in a precise box. This is a duplicate of #1217189, but for some reason neither @oibaf nor me can reopen it. It is in "fix released" state, but the problem is at most partially solved. It seems that the bug no longer causes lockups (described in another bug: #1215513), but is still present (as I get error messages on boot screen and after $ dmesg | grep zram). If someone has enough privileges to reopen 1217189 for "linux (ubuntu)" (I don't know about raring, but no one complains, so it is probably ok), and remove this bug (maybe merging this message to the comments in 1217189), I would be really grateful. Kernel Linux 3.2.0-56-generic-pae (the problem was first observed in 53 and since 54 there are no lockups). Thank of reporting this -- it looks like the fix for the Precise kernels is actually missing. Could you explain, how to install it? When I click on any of those packages, I end up in Ubuntu Software Center with an error message and no "install" button. Are you sure they are fine? I was finally able to reproduce this bug myself on 3.2.0-55-powerpc-smp , so I confirmed it. Note that the messages only happened for the first time on the latest 10 boot or so (I did a "dmesg | grep zram" after every boot). @henrix It works! Thank you very much. The error message used to appear on every boot and now I rebooted 3x and it's ok (I checked dmesg each time). @oibaf Thanks for explanation, the installation was smooth and so far everything is fine. Here it is different than in your case, because the messages seemed to happen on every boot. P.S. I won't be using this computer from Monday (for some time), so if you would like me to test sth, please write today (2013-11-03). I will see if this is just cosmetics or if it will cause problems. Damian, thank you for testing. 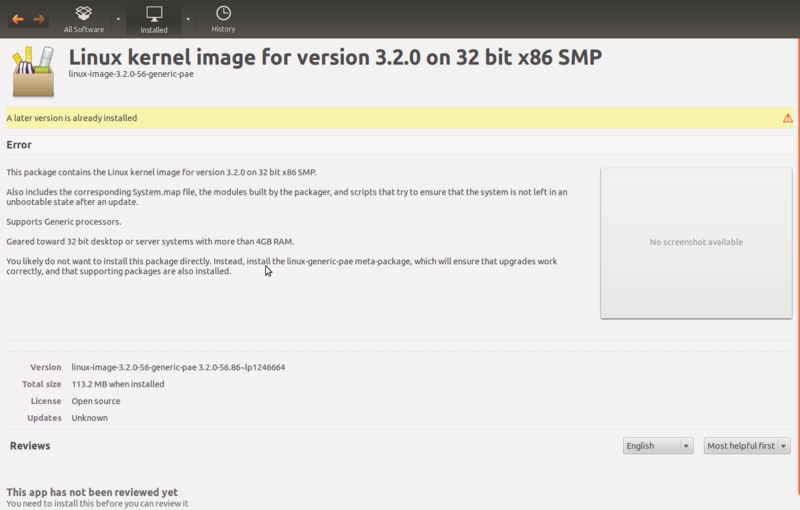 I'll make sure this fix will make its way into the Ubuntu Precise kernel. linux kernel 3.2.0-55 generic is the one used. I would be very glad to get a 3.2.0-55 generic patched. I would like to know what is the fix that you use? Oibaf also told me "About the "stop" you should open a new bug." : do you confirm the "Stop" line should not be missing in the /etc/init/zram-config.conf file, if so that it is not what triggers problems, and therefore that I should open a new bug for it? Melodie: The fix will be included in the 3.2 -generic kernel once its accepted and goes throught the SRU process. I've sent the request to the kernel team mailing list (https://lists.ubuntu.com/archives/kernel-team/2013-November/034151.html). I will build and post here a link to amd64 and i386 kernels containing this fix so that people can test/use it while the kernel isn't released. I will be looking forward to it. Thanks a lot! There's a directory for each arch. Also, the top-level directory contains the patch that has been applied on top of the 3.2.0-56.86 kernel. Applied the fix as per kernel-team@ version. Based on the upstream commit ID this is fixed in saucy and later, marked so. @henrix You wrote about installing "zram-config" in the description. Is it normal, that I didn't have the package installed, but the error still occurred and zram0 was visible after 'swapon -s'? > Is it normal, that I didn't have the package installed, but the error still occurred and zram0 was visible after 'swapon -s'? If you didn't have zram-config installed before, or another script meant to load and configure it's behavior… the zram module should not be loaded, nor the zram devices created. To damian-sawiicki: Do you see a zram-config.conf file under /etc/init ? Another stupid question: did you precisely invoke "dpkg --purge zram-config" ? (When I realized I still had zram-config at work after uninstalling it, I didn't think about "dpkg --purge" and just removed whatever "zram" files I found in the system, especially /dev/zram0 and /dev/zram1 as the machine has two cores, and eventually zram-config.conf if it was still there, but I am not even sure it was still there). To Luis Henriques: I installed the generic i386 kernel and headers in a P4, and it has also been installed to a T60 where it was running with many programs at same time and zram-config installed and at work. All this lasted about 45 minutes and the session didn't fail, although some swapping was occurring. No buffer I/O occurred. Before meeting with the buffer I/O error I used to change the default values for the size of the swap devices (lower the size to 1/4) and setup the swappiness to 0, but for the test I do leave the default values unchanged. I will come back later to add information according to the results I will get. Now I will start an additional heavy load by starting Ubuntu Builder and build a custom ISO with your newer kernel and reinstall zram-config to it. (At least to test the behavior while 'heavy duty' is being done). [ 25.841182] zram: module is from the staging directory, the quality is unknown, you have been warned. Ok, after more than one hour and a half, with lots of heavy programs started at same time no issue, no freeze on the P4. On the T60 with the 3.2.0-55 generic and zram-config in use the session was exiting really fast and sending the user back to the login screen. With the 3.2.0-56 generic no such issue happened, and no I/O buffer error in either of the two machines. Thanks a lot to the people who fixed it! I'll be looking forward to get it from the repositories. (I don't have systems installed for other architectures to test on). I my case it is mostly unrelated and really nothing very important. It happened in a Synaptic started inside the chroot of Ubuntu-Builder, so the post-install script was a bit confused I guess, because there were already /dev/zram* created and in use. and from there the problem is solved. While doing so, the console stated in the output "downgrading". When will your patch be integrated to the current kernel for Precise? Mélodie: the 3.2.0-56.86 kernel does not yet contain the fix. This fix has already been included in the git source tree, and will need to go through the SRU process before being released. This bug will be updated once this happens. Thank you. henrix: Thank you very much. I hope it will not be too long before it will be gone through the SRU process and delivered. [ 2.440692] zram: module is from the staging directory, the quality is unknown, you have been warned. I don't understand why you post about the former 3.2.0-55-generic kernel where the bug didn't exist? What do you intend to say? @meets Why do you claim that it 3.2.0-55 is bug free? I first noticed the bug in version 53 (generic-pae) and then in 54. Was it fixed in 55 and recreated in 56? @oibaf reported the bug in 3.2.0-55-powerpc-smp. P.S. I will address your questions from the previous post as far as I reach the buggy computer. "Remember, this bug report is a duplicate of bug #1246664. Comment here only if you think the duplicate status is wrong." I just reinstalled the 3.2.0-55 generic to check, and yes here it does not trigger errors. Only the next one does. [ 32.717593] zram: module is from the staging directory, the quality is unknown, you have been warned. And zram is up and running, whereas with the next version it is started during the boot, but then stopped I don't know when. What is sure is that after the lines of "Buffer I/O error" zram is not loaded nor used in the session. Well no, mistake : it is not running although there is no I/O error during boot. My bad. The version currently in proposed (3.2.0-57.87) seems to fix the issue here. If someone else seconds that, let's mark this as verified. The new kernel 3.2.0-57 generic (and headers) is installed and running in P4 Dell, almost ready to run on another machines, checkbox-gtk installed: the package lacks a dependency to python-dateutil which I had to install additionally as I don't run an Ubuntu Unity version. (This might need a new bug report). I will now start the checkbox-gtk procedure and then start testing how zram-config behaves with the new version kernel. Later I will also try to switch to the 3.2.0-57 pae version and will come back to say how it goes. P4 Dell tower. Here is enclosed the hardware submission (not yet appeared on Launchpad but I add it as an attachment). Next I will do that, and also test in a T60 thinkpad. On the T60 with 2 GB RAM it has ran during one hour, installing one by one several little games using the Software Center, and having firefox and htop running as well as pcmanfm. No problem met so far. The now I am running the same machine and Ubuntu version with 512 MB ram and it swaps a little, while Software Center installs one more game, Firefox running, gThumbs opened, a console, a mousepad editor, and a "system benchmark and profiler" launched but not active. It all works fine, with zram enabled and the generic version of the kernel. I would be worth trying on the same machine with a pae version perhaps? I will install it and say tomorrow or the day after if no issue occurred with the 3.2.0-57-pae. I don't have a machine to test others, but I will try to find someone who could have the relevant hardware. I tested Mélodie's system in a Toshiba with an Intel i5 processor according to the attached file "submission.xml". zram was active (without any tweaks by me). >> Yes What do you expect Xnoise to do? I'm familiar with Audacity. > certain videos, but not all. I did not install any multimedia package (only used what comes with Bento). > and save it for the bug report page. Thanks a lot! I am looking forward to seeing it in the repositories! I confirm that the new kernel 3.2.0-58-generic-pae works like a charm. Thank you very much. @meets (regarding comment #37): I still can't remove zram and don't know what activates it. There is no zram in /etc/init. [ 1.338734] zram: module is from the staging directory, the quality is unknown, you have been warned. Hi Damian, what does return "sudo updatedb ; locate zram" in the console? According to you output zram does not appear to be loaded, if it was we would see a zram device, ie: /dev/zram0, /dev/zram1 (if your machine has two processors, dual core, core duo, or hyperthreading). and you can uninstall all the previous kernels and headers which have been installed in your system before the 3.2.0-58. If you fear something works less well, you could keep the two last sets, linux-image and linux-headers, ie 3.2.0-58 and 3.2.0-56. You can use Synaptic to do that (filter with "search > name > linux" then, "search > name > headers", then click on the top of the first row to gather the said names which a related to installed packages). You will gain more or less 120 MB for each old kernel + headers removed. PS: I think the --purge you performed previously might have removed the faulty zram config file still in the system at that moment and solved the issue in spite of the "not installed package" warning.